Have my eternal gratitude and exclusive early access to the weekly episodes of REBEL REBEL or KING, as well as access to extra hidden episodes just for patrons. Exclusive FREE books, art or prints! *You must remain a patron for at least three months before being eligible for this reward. Credit (& beer) when books are printed! 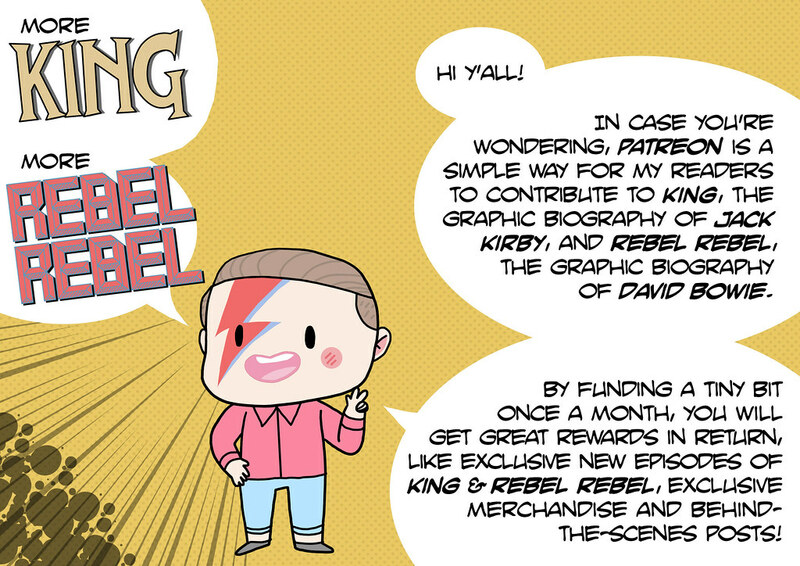 Your name in the credits when the first collected volume of REBEL REBEL or KING are released, thanking you for your contribution. I will buy you a beer in London or Athens and we can discuss all things REBEL REBEL or KING, comics or art. *You must remain a patron for at least three months before being eligible for this reward. You are responsible for your own travel and lodging, of course. If I achieve this goal, I will make a wallpaper library of REBEL REBEL (and other) artwork available to all patrons incl. new facebook covers and profiles and wallpapers for desktops and devices!